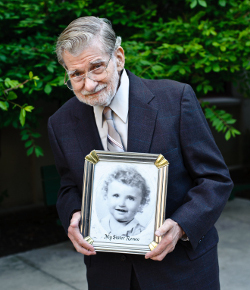 Seymour Angert supports National Jewish Health to honor his little sister, Renee, who died at age three. Seymour Angert of Chicago was a longtime donor to National Jewish Health when he decided to make a larger gift in the form of a charitable gift annuity. It also brought him some closure. Seymour lost his little sister, Renee, when she was three years old and he was eight. It happened in 1937, during the Great Depression. "I remember the doctor came to the house and said she had a stomach cold," he says. "Then a few days later a strange man came to our house and took her away wrapped in a blanket. It was the last time I saw her." Renee died of a burst appendix. "She was my little angel and my companion," he says. Not being able to help Renee haunted him. So did nightmares of how she died. Seymour helped his parents survive during the 1930s and 1940s. He grew up and served as a master sergeant in the National Guard. Eventually, he became an accountant, helped to put two of his siblings through school, and later, his own three children. His son, Robert, is a neonatologist at Albert Einstein College of Medicine in New York. Throughout the years, Seymour remembered hearing about the "hospital in Denver" that "saved babies" and "where the doctors helped TB patients for free." He began sending what he could to National Jewish Health, anywhere from $5 to $50. He never forgot about Renee, and later his family suffered another loss. His grandson, Jack Irving Angert, died when he was 2 days old. Seymour started contemplating a donation in memory of his baby sister and grandson a few years ago. Once he made the decision, it gave him peace and "the nightmares stopped." A CGA through National Jewish Health provides fixed income for life, while also supporting the hospital's mission. There are tax benefits to CGAs as well. The initial gift is partially income tax-deductible and the CGA payments are partially income tax-free. It makes Seymour happy to think of helping children improve their health and attend Morgridge Academy for chronically ill children. There's a plaque on the wall there honoring the memories of his sister and grandson. "I've cleansed myself of the grief and pain," Seymour said. "I believe I did the right thing." Learn about ways you can provide long-term support to patients at National Jewish Health by contacting Gordon Smith, MBA, CFRE, 1.800.423.8891, Ext. 6549 or giftplanning@njhealth.org.